Ebike Prices | Reviews | Specs and Buyers Guide! Greater power, as you get in a moped, yet retaining the fitness factor as you still might be pedaling for some time, is what you get from an electric bicycle. The motors in electric bicycles are often powerful but not powerful enough as in mopeds. So you can reach decent speeds but not too high. When it comes to the speed control option, you get two types of electric bicycles. The two types are pedal assist and hand throttle controls. In some regions, hand throttle is not allowed in electric bicycles. The type of battery that comes with the bicycle is another factor that differs and so does the charging time and the energy efficiency. One main advantage is that if your electric bicycle battery discharges fully in the middle of your ride, you can still continue pedaling it. In comparison with normal bicycles, electric bicycles are heavier due to the battery and motor included. The electric bicycle price would also be little higher than that of a normal bicycle. Choose the best electric bicycle according to the height and weight of the rider, the type of use and the distance you would ride it daily. Also, consider the motor power you need and the top speed required. Here are the top e bikes for 2018 based on user reviews, features, and the pricing range. ANCHEER Power Plus Electric Mountain Bike, 26''... 276 Reviews PRICE & MORE DETAILS! 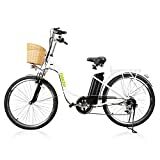 nakto Electric Bicycle Sporting Shimano 6 Speed... No ratings yet PRICE & MORE DETAILS! It comes as a full package with all the required components. You will be building your electric bicycle from scratch. You also get to choose the battery you wish to include in the package. With a powerful 3000W motor, it comes with 6 or 7 speed gear options. For a higher speed choose the 72V battery package. The bike has disc brakes and a rear shock suspension for smoother ride experience. You can choose to buy without the battery if you plan to buy one outside. But the battery that comes in the package is a Samsung battery cell Li-ion battery which comes with a pretty long life and quality than the other Li-ion batteries in the market. The big ergonomic seat offers absolute comfort for the rider. The frame is sleek yet sturdy. On the sides of the cranks, there are buttons that facilitate gear change. The hydraulic brake system of the bike offers responsive braking for added safety. The package includes the motor kit, front wheel and tire, front pork, frame, crankset, rear suspension, chain wheel and the braking system, handlebar set and the seat. The assembly video provides a detailed demonstration to get your bike up and running in a short time. The frame is made of a tough aluminum alloy and the front fork is in carbon steel. So the bike is pretty tough. Front and rear brakes are both disc. There is a 21-speed transmission system. The bike also comes with an LED headlamp and a horn. The Li-ion battery included in the package is removable and also comes with a charger included in the kit. The bike gives a good 35 to 60km ride after a full charge of the battery. The design of the bike and every detailing is done ergonomically for extra comfort and safety of the rider. Both the wheels are made of double layer aluminum alloys for a sturdy ride. The tires offer great grip even on wet roads. The lightweight frame of the bike offers better energy efficiency and greater handling. This electric bike offers 3 riding modes- booster riding, fully electric and the fully manual riding modes. Thus for beginners, this is the best electric bike in 2016 which offers greater features and flexibility in riding options. This e-bike is specially designed keeping women riders in mind. 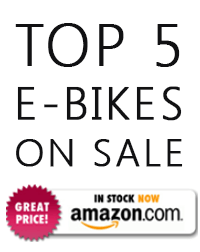 This is the best electric bicycle price wise among the 3 we are talking about. With a beginner level 250W motor, you can choose the pedal assist mode or the throttle mode when you ride. The 6-speed gear system allows you to reach up to a 25mph top speed. The steel alloy frame offers a more stable and sturdy riding experience. The cargo deck at the back, the basket, horn and lights all are included in the package. Though it is a little heavy for a women’s bike, it is pretty easy to ride. The 36V battery system also comes with a battery charger. The removable battery system makes it easy to install and remove the battery for easy charging. After a full charge, if you choose to ride with the pedal assist mode, then you would get an impressive 28 to 38 km ride till the battery discharges. This cargo bicycle comes with a spacious front basket and a decent sized cargo rack on the backside making it a perfect option for normal everyday city commutes. This tough bike can take a maximum load of up to 250 pounds. The brake system consists of V brakes in the front and expansion brakes at the back. These offer a good braking response on city roads. As you can see for yourself, the bikes listed above are designed for different types of users. We sincerely hope that our short but in-depth review will definitely help you in choosing the right bike for your needs. 1.0.4 Preview Product Rating ANCHEER Power Plus Electric Mountain Bike, 26''... 276 Reviews PRICE & MORE DETAILS! 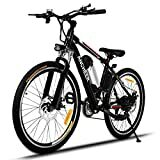 nakto Electric Bicycle Sporting Shimano 6 Speed... No ratings yet PRICE & MORE DETAILS! 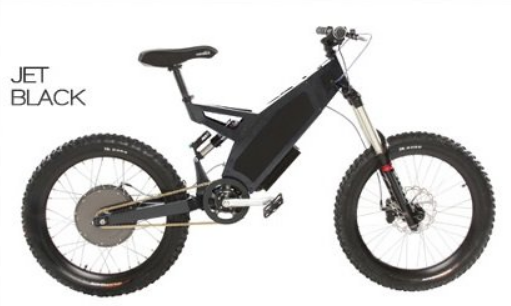 Copyright © 2019 ELECTRIC BICYCLE NETWORK EBIKE PRICES | REVIEWS | SPECS AND BUYERS GUIDE!. All Rights Reserved.